The Komondor dog is immediately recognizable due to its long white-corded coat. They are often described as looking like a mop, though they are a large, muscular breed beneath the cords. The coat provides protection for the dogs (plural Komondorok) in their native Hungary as they perform their livestock guardian duties. They have been guarding flocks for more than 1000 years. Strong and courageous, this Hungarian Sheep Dog is affectionate with his family, but these dogs are not for everyone. They are very protective of their home and family. They should be well-socialized and trained from an early age and they need an experienced owner. The Komondor dog has been a livestock guardian dog (not a herding dog), protecting flocks in Hungary for centuries. It’s believed that they came to Hungary with the Cumans, a Turkish-speaking nomadic people who settled in Hungary during the 12th and 13th century. Another version of the breed’s origin claims that the dogs were brought to Hungary via the Russian steppes and are related to massive Russian livestock guardian dogs called the South Russian Ovcharka. 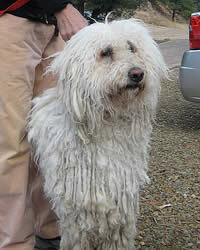 The Komondor dog is likely related to the Puli dog and the Bergamasco since both breeds also have a corded coat. Whatever the case, this dog breed was described in its present state by the 16th century. The dog’s cords protect it not just from extremes of weather but also from attacks by bears and wolves since the thick coat makes it harder for animals to bite through to the skin. The breed has always been much used in Hungary. They suffered enormous losses during World War II since they were so protective of their families and homes. It’s believed that many dogs were killed trying to protect their owners from enemy soldiers. Today, these dogs are seen in the show ring and doing obedience in the United States. He remains a popular breed in Hungary. The Komondor dog is a strong, dignified and courageous dog. They are known for their protective characteristics, whether they are guarding herds of sheep from attacks by bears and wolves, or guarding their owner’s home. They are said to be reserved and serious with strangers but demonstrative with their family. These dogs do require plenty of socialization and dog training from a young age in order to overcome some of their protective instincts. They tend to be a dominant breed and they will assert themselves in the home if the owner does not make it clear that he or she is in charge. Komondorok are typically calm unless they are called upon to defend their home or owner. They are capable of thinking and acting independently, the result of 1000 years of making their own decisions when guarding flocks. They are affectionate with their family and gentle with children. They usually accept friends of the family once they have been introduced. These dogs are usually good with other pets. They normally rest during the daytime but they will be vigilant at night. These are fast, powerful dogs and it must be stressed that training from a young age is necessary so an owner is in charge. Living Environment – The Komondor dog is a large dog that needs a lot of exercise. They typically sleep during the day and stand guard at night. They don’t usually do well as apartment dogs. Some Komondorok are more suited to being working dogs instead of family pets, while other dogs make very good family companions. You should talk to a breeder and let them know exactly what you are seeking in a puppy or dog. This breed prefers to have a large yard of his own. Because of their thick, corded coat, these dogs often enjoy sleeping outdoors and they will patrol your grounds at night, given the opportunity. Grooming – Grooming for this breed is an endeavor. The dog’s coat begins to clump into cords when they are a few months old and it takes a couple of years for the coat to be fully corded to the ground. The cords are very heavy. They should never, ever be brushed since this will result in a mass of fuzzy hair. Leave the cords in place, even when the dog is bathed. It takes several hours to blowdry the cords on the dog. If the coat is allowed to dry naturally it usually takes a couple of days to dry. If the coat doesn’t dry well it may mildew. The coat actually sheds very little since all of the hair grows into the cords. The bottom of the cords may be trimmed a little to keep them from looking ragged. Keep the hair around the paws trimmed. Diet & Exercise – Dietary needs are considered normal. They are somewhat prone to bloat so it’s best to feed them 2-3 smaller meals during the day instead of one large meal. They do need regular daily exercise such as long walks. These dogs are prone to sleep during the day but they are very alert and prefer to keep watch during the night. They still need to have regular exercise to keep them mentally and physically fit. Health – In the health department, this is a generally healthy breed but they can be prone to a few health problems such as canine hip dysplasia, bloat, entropion and cataracts. Fleas and other parasites can be a particular problem with this breed because of their thick coat, so make sure you use a good preventive. You will also need to keep the ears cleaned to prevent ear infections. If you are interested in this breed you should talk to a breeder about possible dog health problems. The Komondor dog is a large, powerful breed with protective instincts. They need to start socialization and dog training at a young age. In addition, they need to have an owner who is, preferably, experienced with dogs and who is comfortable being in a leadership position. Otherwise, these dogs can be dominant and take charge themselves. With the right owner they can be a great companion dog. They can do very well with training if you begin early. They may be obstinate at times and they can be very independent, but if you make training fun and interesting for them they should do well. You should never use harsh methods with this breed. Use positive dog training methods (praise, reward) and your dog should learn well.